CORONATUS enchants the gothic Metal scene with the power of its two female voices, traveling us to places we only dreamed off. Taking a little bit of time to answer a few questions, here's Carmen! Let me greet you from Greece and tell you how happy I was to see that CORONATUS released a new album. Hello to you, I am glad that you like our music! New band members have joined in. How did these changes affect the band? The biggest news is our new singer, Lisa, with her profound and low-pitched Rock voice. Second, there is our new guitarist, Aria Keramati Noori from Iran, who helped making our sound more aggressive and many of the songs faster than we played ever before. Third, there is our bassist Todd Goldfinger from the USA. Through his playing technique with fingers instead of pick, he can play extremely quick, which suits our music – also the slower songs - really well. You create songs in three different languages: Latin, German and English. Why not choose the safest of ways and write songs in one language? Why would that way be safe? We love the diversity – writing songs in our mother tongue German, songs in the language of modern music, English, and songs in the ancient and mighty language Latin, as we do not know the Greek language! There are many who do not look with a serious eye at female fronted bands, although the bands prove them all the time different. How hard is CORONATUS's journey in the Metal scene? It is great to have special venues like the 'Metal Female Voices Fest' in Belgium, where we played in 2009 and thousands of fans of that music are there. Spreading our music and selling the CDs worldwide is not so much a problem. But when it comes to club concerts, it seems that there are more spectators at Death or Black Metal concerts, unfortunately. To add to the above question: we also have many great female-fronted bands already established and also new ones appearing all the time. What brings CORONATUS to the scene that makes them different? First, it is the fact that we have two front ladies: me, singing in the classical style, and always a second one, who is momentarily Lisa, singing in the Rock style. Second, it is the three different languages of our lyrics, as you have already mentioned. And last but not least it is our music style in general: We combine the typical female-fronted symphonic/bombast Metal with pagan Metal, which can be heard on our current album "Fabula Magna" more than ever. Lisa's voice sounds more direct, more edgy than Ada, she has a clean rocking sound and we could hear a small twist from the classical sound to a more Rock one. Will this be the new path that CORONATUS will explore in the future? With our new album "Fabula Magna" we are very happy – we have put lots of efforts in order to reach exactly the sound we have now. E.g. the drums and guitars are more aggressive and direct than before, yet building a unity with the clean and very melodic vocals. We have had it in our ears before we began with the songwriting process and we resulted in achieving the sound to our 100% satisfaction. Do you believe that mainstreaming the sound into something more familiar to the average Metal fan will make easier the acceptance that CORONATUS will receive? On the contrary, if we played more mainstream that we do now, it would be harder, e.g. our first album, "Lux Noctis" did not contain the pagan Metal elements yet and the Rock voice was not so much a Rock voice but rather a normal, lower-pitched, voice. So that album did not contain so much variety. It reminded many people of NIGHTWISH without as much orchestra as they use and this is why some journalists did not like that album as much as the following two. This is what I mean that the acceptance would not be bigger than it is now. However, the music fans worldwide proved them all wrong and have liked our music right from the beginning, haha! Who is the main songwriting force behind CORONATUS? 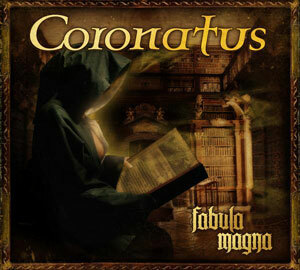 Is it a common effort or the result of one person's creativity, since CORONATUS always have powerful songs and music? In fact, we all write the songs together. Most of us contributed a song and helped working on the other ones. This is, by the way, also something, that is different to lots of other bands. Where does CORONATUS draw its influences from? What makes CORONATUS be CORONATUS, and where does all the creativity come from? Of course we like many other Metal bands from symphonic to pagan, Black and Death and even electronic Metal. Referring to the music, we are inspired by the best elements of each genre (like polka rhythms alternating with aggressive rhythms, vast choirs…) and create our own style out of them. Referring to the lyrics, we are inspired by nature, force majeure, love, life, death…If you work with music every day, you have more practice in getting ideas than e.g. anyone who is much less familiar with creating songs. Last but not least it is our good teamwork that makes our music the one it is today, in all its diversity and its entire uniqueness. Third album out: what are the next steps for the band? what are CORONATUS's future plans? We are just working on video clips, which will be our first real music video clips. Currently we are also looking for a booking agency in order to increase our appearance at festivals and play a small tour. Will there be any chance to see you live, on stage here in my homeland (Greece)? It would be amazing to see CORONATUS live, talking like a fan now. This would also be a great opportunity for us and whenever we get a suitable offer, we will take the chance! Anything you wish to add for us please do so and I hope and wish everything good for you and the band. Did you know that we have a song about a Greek saga? It is the legend of Tantalos, great stuff! You can download it free of charge from our website www.coronatus.de, where you can also subscribe to our newsletter.